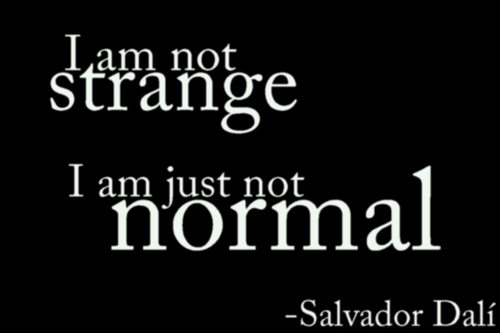 Normal… that peculiar notion of fitting in with those around us. Not with society… but with those around us. In highschool, some people felt it was normal to be with the cool kids, others with the nerds and so on. At work, for me, the designers tend to fit in with other designers more so than programmers and programmers tend to fit in with other programmers better than designers. For parents, we want our children to be normal in the sense that they feel comfortable fitting in with other children that are good influences. If they tend to fall in with “the wrong crowd”…. then perhaps normal to them is something that we (the parents) won’t be too comfortable with. For those of us with special needs children, we think of normal in an entirely different context. Normal is much more abstract than all of that. Normal is a conflicting array of all that we could ever wish for and the last thing we’d ever want. A funny thing happens when we have a child. I like to call it “their life flashing before your eyes.” They’re born, you flash a glimpse of their entire life… in contrast to when you are dying and you flash a glimpse of your own entire life. Essentially, we see a fresh new start with limitless possibilities and all of the ways our child’s life can be so much better than our own was. With that comes a very strong desire for our child to be anything but normal. We see them standing against the crowd, standing up to bullies, being able to think differently and creatively… all of the wonderful qualities that makes an innovator, trail blazer and leader. The last thing we want for our child is to be… mediocre… average… normal. The whole problem with the dream of bringing a child into the world that will be anything but normal is that we teach them from day one to be exactly that… normal. Do as your told, eat all your food, say please & thank you, respect your elders and on and on and on… they’re all good things for people to know and do. But without really putting much thought into it, you are setting your child on the path to being normal. We send our child to day care, school, play dates, the park… all in an effort to make friends like everyone else. To go to birthday parties like everyone else. To just fit in. Oh, we still want for them to be great… to be smarter than the other kids, to get straight A’s in school and to be the cool kid that others want to hang out with. But we sort of want them to do it the ‘normal’ way. Chances are, if your child has autism, you knew before the diagnosis that something wasn’t… dare I say it… normal. But receiving the official word from the doctor is usually the moment that it truly sinks in for us and our notion of just what was and wasn’t normal is completely changed. It’s pretty much at that point where all of the optimistic dreams of limitless possibilities leave us and we look at our child wishing for exactly the one thing that we didn’t want for them… to be normal. Hopefully, if we learn how to help our child, where to get help, what works best and what doesn’t and we figure out what our child is truly capable of… we start to realize that all of this time, through all of these dreams and doubts… we got exactly what we wanted. Our child is not normal. We wanted it from the start, we dreamt of it and we wished for it… we just didn’t picture it this way. But that shouldn’t get us down. Our child is beautiful and wonderful and amazing! We find ourselves taking great appreciation in the nuances of speech, our senses, the patterns around us, the finer details, the strengths and weaknesses in others and ourselves, the world around us and in the power of unconditional love. Our children continue to grow and show us just how much we’ve been missing in our lives. Just how much we were completely unaware of all around us. We missed it… because we’re normal. Thank you for so beautifully expressing the love, joy, understanding, compassion and acceptance that you have for your son. “Different,” is a blessing if you change your preconceived notions of what that is. There is much to be learned by these incredible children. WE need to attune ourselves to the gifts that they possess and stop looking to make them too much like US. they see, hear, and feel things that we are not able to. They are intuitive beyond belief and their hearts are bigger than we can imagine. Thanks for your work with the blog. My younger brother is an 8th grader who has Autism.